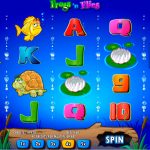 Frogs ‘n Flies is a nice video slot game from Amaya that takes place in a cool blue underwater world. The yellow fish will wink at you every time it swims away, and there are also some other nice animations that you need to see for yourself. The sound effects, especially the swamp like ones are really nice addition to the game. The frog symbol is the wild in Frogs ‘n Flies and it appears only on the second and the fourth reel. Its function is to stand in for every other symbol to complete a winning line except for the scatter. The game’s logo is the scatter symbol and it activates the main feature, the free spins round. 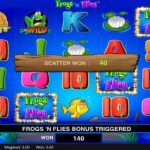 You need to land 3 scatter symbols to receive 5 free spins, 4 scatter symbols to receive 10 free spins and 5 scatter symbols to receive 20 free spins. What makes this feature so special is the fact that extra wilds are added to the second, third, fourth and the fifth reel, and it is also possible to retrigger the feature. 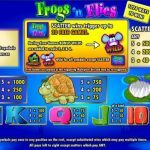 Frogs ‘n Flies is a cute and humoristic video slot game coming from Amaya. They have used a theme that is really entertaining and made this slot so adorable. But that is not all that this game has to offer. We have a really nice and straightforward game play here and a possibility to activate the free spins round. There is only one feature in this game but still it turns out to be quite lucrative so it is enough to us. We had a really nice session so we believe that if you give this game a chance you will too. For an adventure like in the good old times consider playing Fortunes of the Amazons a 5 reel slot by Amaya.